Often children are frightened and confused by their own angry feelings. They need to be reassured that this emotion is a normal part of life. 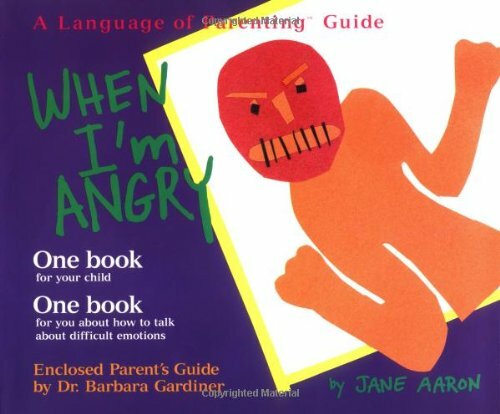 When I'm Angry, one of the first books in the Language of Parenting series, explains this difficult subject in a completely original and practical way. Jane Aaron's boldly illustrated children's book features simple language and vivid imaged that capture a child's attention. Depicting kids in typical situation that evoke anger, the illustrations help children realize that others not only experience the same feelings, but find positive ways to cope with them. --frustration over losing a game. Dr. Gardiner's Language of Parenting is based on the fundamental ABC' of parenting: acknowledging a child's feelings (accepting anger and directing it appropriately), having age-appropriate behavioral expectations (a two-year old should be able to sit at the table without throwing food), and demonstrating consistency in parenting style (maintaining house rules such as bedtime). She emphasizes the importance of allowing children to generate their own solutions. Jane Aaron is a best-selling illustrator and an acclaimed director of animation. She illustrated the New York Times bestseller No More Secrets for Me and Close to Home. Aaron has designed, produced, and directed more than 75 short animated films for Sesame Street, and her animated films have been seen on PBS, Showtime, Cinemax, The Learning Channel, and in many international markets. Her films have been shown in the Whitney Museum of Art, the Hirschhorn Museum, and the Walker Art Center. She is a Guggenheim Fellow. She lives in New York City with her husband and son. Dr. Barbara Gardiner is a clinical psychologist with offices in New York City and Westchester. She has developed the Language of Parenting, a practical and respectful style of parenting that she teaches to parents in both group and individual sessions. The grandmother of two, she lives with her husband in New York City. PreSchool-Grade 2-These books are designed to stimulate conversations between parent and child about the emotion designated in the title. Afraid includes familiar worries such as getting lost, going to the doctor, and falling asleep. In each case, an adult helps assuage the fears. Angry offers no explanation for the child's rage but concentrates on how the emotion affects the angry person and then suggests possible resolutions. The collage illustrations look like construction-paper creations made by the books' intended audience. Characters are yellow, orange, gray, red, and purple. The only person with hair is "mom." Each volume has an accompanying pamphlet for adults about how to help children cope with the targeted feeling. In it, psychologist Barbara Gardiner offers practical suggestions about helping children of different ages deal with emotions and includes sections on when to seek help for extremely fearful and/or angry youngsters. Libraries with a demand for bibliotherapy might consider purchasing these titles, but they would be best placed on the parenting shelves. The picture books themselves are chiefly means to therapeutic ends.